The consensus about the training is that nobody is going to go around policing PUBLIC DEFENDERS OR PRIVATE JUVENILE DEFENDER offices or other offices to see what they are doing in terms of training for assignments, but COURTS can ask individual ATTORNEYS about training as specified in the rule. It will probably play out differently in different courts. Some COURTS may demand that every lawyer appearing before them must fill out the Judicial Council form with respect to training, and others may not. In counties that do not have defender offices, there will probably be discussions about how to assure that someone is always available who is qualified and trained to represent youth. Again, longstanding practices will probably take a while to change in many places, but the hope is that they will change toward having sufficiently trained juvenile attorneys to cover juvenile hearings and appearances. The requirements are not that difficult to meet, so a lot of this will be a cultural change both for the COURTS, PUBLIC DEFENDER OFFICES AND PRIVATE COUNSEL…. My hope is that the new Judicial Council Rule, will help to assure that anyone who “stands in” in any juvenile proceeding or hearing has had juvenile specific training. The practice of “standing in” assumes that there are hearings in which it doesn’t really matter who is there with the minor/ juvenile client. That simply is not true. I have seen so many supposedly “routine” stand ins on continuances or review hearings in which something unexpected happened! You thought it was just a continuance, but it wasn’t. The lawyer standing in there needs to know the law and respond quickly. You also need someone trained in interviewing and working with adolescent clients to explain what is going on with the client and to assure that the client’s interests are asserted. For example, even when it is “just a continuance,” that may mean additional weeks of incarceration for a young person. You cannot just have any old lawyer present or “standing in” – Counsel needs to be someone who knows the timelines and rules for juvenile cases, and who can clearly explain them to the client so a command of Spanish can be vital if translation and interpretation services are limited as they can be in counties with limited resources. All the staff at Fiumara & Milligan Law, PC Speaks fluent Spanish as does Mr. Fiumara. We don’t rest upon our laurels—we keep current and on top of cutting edge changes in the law to better serve our clients. Without our clients, we are not in business. 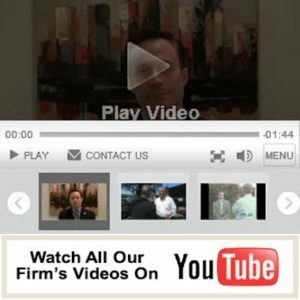 Clients come first at Fiumara & Milligan Law. LOOKOUT FOR PEDESTRIANS IN THE CROSSWALK, ESPECIALLY DURING RAINY AND INCLEMENT WEATHER!